Seattle Times editorial columnist Donna Gordon Blankinship writes: Not every dollar spent to combat homelessness is going to bring people inside, but no public program works 100 percent of the time. Progress is being made on homelessness around the Puget Sound. It isn’t fast enough or big enough, but it is progress. When a problem is so big and complex, smaller successes can be difficult, if not painful, to recognize. Many people find it easier to criticize the “homeless industrial complex” than to see the King County system as a mix of successes and failures. During a one-night count in 2017, more than 11,600 people were found unsheltered, but a far bigger number, nearly 30,000, experienced homeless during some time of the year, according to data from 2017. The homeless problem is growing, says Kira Zylstra, acting director of All Home King County, but so are the solutions. The one-night count in 2015, found 10,000 homeless people in King County, while the numbers were closer to 9,000 in 2014. In 2017, the King County system found permanent homes for twice as many households as in 2013, Zylstra points out. The worst part: so many more people needed help to stay indoors. In the fourth quarter of 2017, for example, All Home King County reported 1,758 families and individuals were placed in permanent housing, but their goal was to house 4,143 households, and thousands were left in emergency shelters and on the street. Homelessness represents many different problems demanding a variety of solutions. A single mom who is about to lose her apartment because her car broke down and she can’t get to work can’t be lumped in with the chronic alcoholic who hasn’t lived indoors for a decade. Their situations are also different from foster children who have aged out of the system, single adults who don’t earn enough to rent an apartment anywhere near their jobs and people with no place to land after incarceration. In one year, between April 2016 and March 2017, people from 242 households who asked the King County coordinated entry program for help were connected with permanent housing — without entering a shelter. More than a thousand households went from homeless to housed in 2017 through “rapid rehousing,” which is a little like diversion, but it takes longer and usually involves a few months in temporary housing. The more impressive statistic shows only 8.6 percent of the households that left homelessness through “rapid rehousing” returned to the system within 24 months. For those with addiction or mental-health problems, a home along with a few months of financial assistance is not enough. In 2005, the Downtown Emergency Service Center opened 1811 Eastlake to provide supportive housing for 75 formerly homeless adults with chronic alcohol addiction. The innovative yet controversial “housing first” model has proved successful at cutting the county’s charity health-care costs for some of the sickest homeless people, brought 75 people indoors where they could get health care, food and other services, and even led to sobriety for some residents. The Downtown Emergency Service Center now operates a dozen “housing first” buildings for people with addiction problems or mental illness, plus about 300 units in the private housing market for the same purposes. 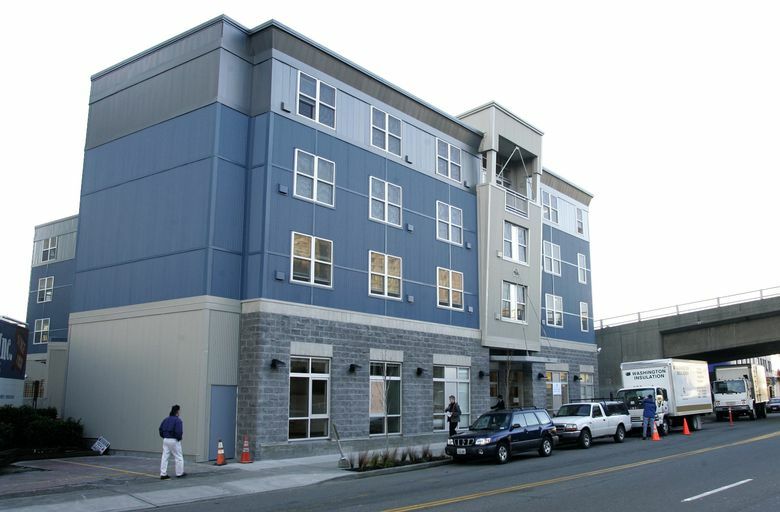 The agency houses about 1,300 people in supportive housing in and around Seattle right now and another 275 apartments are scheduled to open within the next three years. That’s more than a thousand people who are no longer homeless. Still, it’s not enough. DESC Executive Director Daniel Malone estimates housing every person who needs this kind of intense help would require 3,000 more units of supportive housing. The county is chipping away at the homelessness crisis, one segment, one organization at a time. One more project worth noting helps just 75 people but could potentially house many more. A Bellevue nonprofit called Congregations for the Homeless rents large single-family homes around the community and turns them into boardinghouses for previously homeless men. A case manager lives with the men, who each pay rent up to 30 percent of their gross income, to help them get their lives stabilized. How should the region pay to scale up all the successful programs and house more people? I oppose Seattle’s head tax, but not just because it would be a job killer. The fight against homelessness is a King County responsibility, not a Seattle problem. Taxpayers across the county should be asked to take on more of the burden of homelessness and share the cost for successful approaches like these. Donna Gordon Blankinship’s column appears regularly on editorial pages of The Times. Her email address is dblankinship@seattletimes.com. On Twitter @dgblankinship.